At some point in every book, I have to step back and say, “Okay, what the hell is this book about?” Not “What is the plot of this book?” but “What ties everything in this book together?” And that’s what I did last night until I looked up and saw that it was 6:48 AM. I’m a little groggy. Plus, you know, the Drowning Jesus burned. But here’s what I did. First I made a scene list. Usually I have about sixty to sixty-five scenes but this time I have forty. I may add one or two extra ones, but that’s about right since this book is about two-thirds as long as my third-person novels. Then I went through and did a beat breakdown for each one, trying to figure out what each scene was about. As usual, for a lot of them there was no there there. Yet. I’ll have to dig into each one and figure out where the focus is, but I can do that. It’s been hell in Ohio. I stayed up until the sun came up structuring Liz and it’s actually looking pretty tight (until you get to the scene level) but then I read the news and tragedy struck last night. Well, actually, lightning struck. Touchdown Jesus, aka Drowning Jesus is no more. 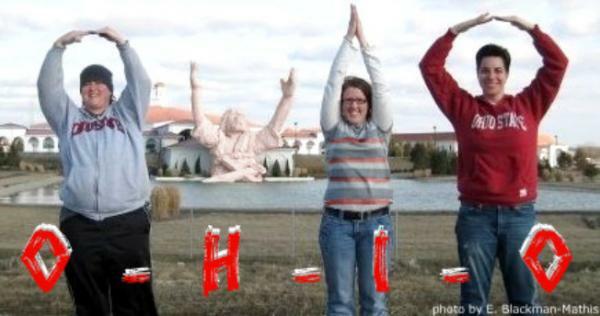 I can’t remember if I posted about Touchdown Jesus before–he made a great H in the O-H-I-O cheer–but anybody who ever went north into Ohio on 75 knew him well. And now he’s gone, completely burned in a lightning strike. I’ll be back to post again later, but suffice to say, Ohio has lost one of its favorite landmarks and we are sad. Or as Lani said, “If that thing had burned before I’d had a chance to see it, I would have been upset.” (You really had to experience it without knowing it was coming. On our way up 75 the first time, I’d said, “Pay attention on your right coming up,” but it really wasn’t necessary. The thing was sixty-two feet tall. As I recall, she said, “Oh. My. GOD.” and then laughed hysterically all the way to Wapak. Updated to add: Gawker has the story, too, and there are many links in the comments.